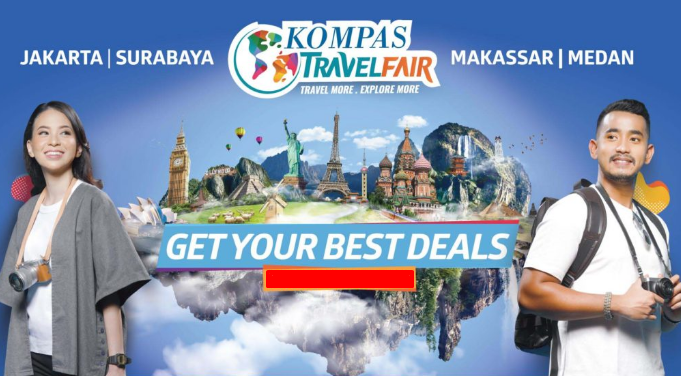 Kompas Travel Fair 2018 For Your Tourist Destination is Come Back! Home › Attractions › Info › Wisata › Kompas Travel Fair 2018 For Your Tourist Destination is Come Back! Jalanpedia.com- Long vacation? But still have a pile of work? Tired of working and needing a vacation, confused about expensive ticket prices, don't worry because Kompas Travel Fair (KTF) 2018 is again held by Harian Kompas. Seeing that developments in the tourism world continue to grow every year, not only through the tourist section, Kompas also organizes tourist exhibitions for you travel lovers. Located in Jakarta, Surabaya, Medan and Makassar, the KTF tourism exhibition this time provides a variety of attractive offers for vacation packages, airplane tickets, tourist arenas, hotels to travel supplies that you need. For Jakarta, KTF cooperates with CIMB Niaga Bank. While in Surabaya, Medan and Makassar, KTF collaborates with Bank Danamon. Kompas Travel Fair 2016 (KOMPAS TRAVEL FAIR) The exhibition which is entering its seventh year will be held on 7-9 September 2018 in these cities. For those of you in Jakarta, you can visit the Jakarta Convention Center to get an attractive KTF offer. No need to go far to Jakarta, those of you who live in Makassar can get attractive promos by visiting the KTF booth located in Phinisi Point Makassar. For arek-arek Suroboyo, you can visit KTF at Pakuwon Mall Surabaya. And for you Medan residents you can also get attractive prices for vacation packages at Center Point Mall Medan. Hurry up and come! Who knows, you will get lots of pieces and surprises from the organizers and sponsors who knows if you are lucky you can get a ticket price for your vacation trip at KTF 2018 from the following airlines; Garuda Indonesia, Citilink, ANA, Cathay Pacific, China Airlines, EVA Air, Ethiopian Airlines, Malaysia Airlines, Oman Air, Singapore Airlines, Qatar Airways.